Along with ASUS, Google designed the Nexus 7 with Google Play in mind. Everything from the homescreens to the way content is consumed, the N7 was designed with these things in mind. One thing that you may have noticed, though, is that it using a phone-like interface, not Android's dedicated tablet-optimized interface. This is clearly a design choice purposefully made by Google, and anyone who has actually used a seven-inch tablet will understand why: the tablet interface is better suited for ten-inch (or larger) devices. Still, we'll have to actually go hands-on to see what a difference this makes for everyday use. The Nexus 7 will be available for pre-order beginning now starting at $199 for the 8GB version, and $250 for the 16GB version, and should begin shipping in mid-July in the U.S., U.K., Canada, and Australia with more countries to come. The Nexus 7 also comes with a $25 Play Store credit, Transformers: Dark of the Moon, The Bourne Dominion ebook, and several magazines. This way, you get to experience all the content right out of the box that the N7 was designed for. 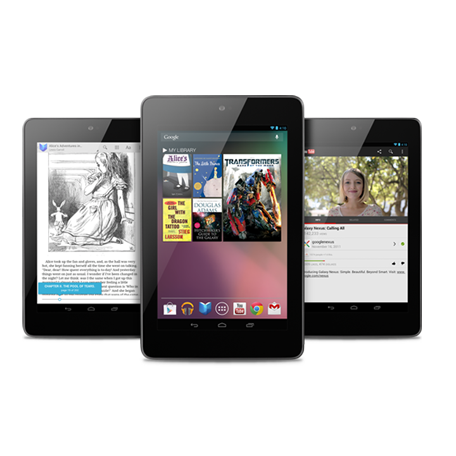 For more information on the Nexus 7, check out the links below.